This spinach salad has lots of protein and a homemade raspberry dressing. Dinner salad or brunch item? You decide. Either way, magic. Mix the warm water with the jam until it's dissolved. Add the rest of the ingredients and mix well. Use a high quality jam and vinegar for best results. As always, adjust to taste. 1. Rinse and remove stems from spinach. Dry. Divide into two bowls. 2. Slice the bacon into half strips (so you'll have 6 small pieces) and cook, preferably in a nonstick pan. Remove bacon and let drain on a paper towel. Don't worry, we're using plenty of grease later. 3. Pour bacon grease into a bowl and set aside. 4. Fry the eggs in the bacon grease drippings remaining in the pan, turning up the heat before adding the eggs to make sure the bottoms crisp up. FYI, Better Homes and Gardens calls this style of cooking an egg “frizzled.” I knew that you wanted to know that. 5. 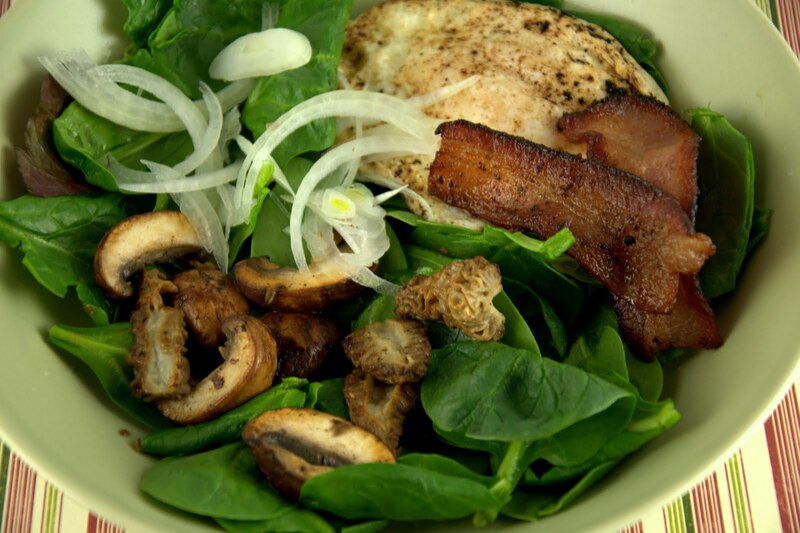 Add eggs and bacon to the salad. Add about one or two teaspoons of bacon grease to the pan, add the mushrooms, cook on medium heat for about 2 minutes. Add another tsp of bacon grease, cook another couple of minutes. Add mushrooms to salad, top with onion/shallot and serve immediately with raspberry vinaigrette.